To meet the growing demand for 3m aluminum profiles, we introduced such products. Not all models are available in this length, so please read the specifications carefully or contact our office to confirm the delivery of the item. Please note that in our store profiles are offered at a unit price of 1mb. If you want to buy a 200cm section put in the basket 2pcs. If a section of 300cm - 3 pieces of course, if it is to be sections 100. 200 or 300 cm, then according to the above multiples of the necessary elements. In order to secure the long transport of items we have signed a contract with a professional courier company specializing in the transport of long items. Delivery of 3m aluminum profiles is realized throughout Europe and beyond. We also regularly deliver to America and Asia, especially in the Middle East. If you are interested in delivery of 3m long aluminum profiles ask for the shipping price. 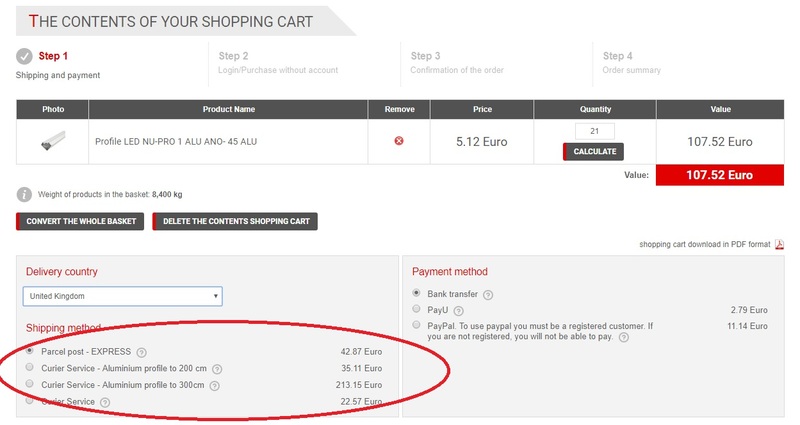 For most popular countries the price is automatically displayed in the online store. If you want to choose profiles of 300cm long, remember to choose a transport for these items later. It is specially marked in the online store. In addition to profiles with a length of 300cm we also offer profiles of standard lengths of 100 and 200cm. Selected profile models are available in lengths of up to 600cm and for them we also offer specialist transport. Our technological base allows you to prepare cut profiles for your order with the accuracy of - / + 0.5mm. We also assemble and seal virtually any type of profile for IP68, IP44 (according to individual valuation) profiles. For the profiles we prepare professional LED strips. If you represent an entrepreneur - we offer deliveries around the world according to export formulas. Within the European Union, these are intra-Community deliveries with 0% VAT, and for exporters from third countries with 0% VAT - please contact our office in advance.